SEOUL, Jan. 9 (Yonhap) — South Korea’s parliamentary committee on the influence-peddling scandal involving President Park Geun-hye and her confidante held its last hearing Monday, with only a few of the 20 summoned witnesses having actually appeared before the National Assembly. The ad hoc panel also approved a motion to extend its mandate by one month, as its authority expires this Sunday. 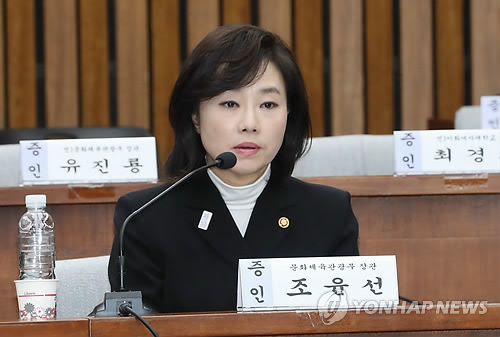 The committee, which kicked off Nov. 17, has been holding a series of sessions to find out the details behind the allegation that Park’s friend Choi Soon-sil exerted influence on state affairs for personal gain. If the motion is approved at a plenary session of the National Assembly, its activity can be extended by up to 30 days. The panel summoned 20 figures to Monday’s hearing, but most key witnesses — including former Senior Presidential Secretary for Civil Affairs Woo Byung-woo, and former Ewha Womans University President Choi Kyung-hee — said they wouldn’t participate. Only a professor from Ehwa Womans University and a former head of the K-Sports Foundation appeared at the hearing in the morning. Culture Minister Cho Yoon-sun attended the hearing later in the afternoon. Cho apologized for disappointing the people over allegations that the government had a blacklist of cultural figures deemed critical of its policies. The parliament earlier claimed Cho lied before the National Assembly by claiming she was not aware of the list. The independent counsel looking into the alleged corruption of Park and Choi, however, reportedly secured evidence that indicated Cho was involved in the creation of the blacklist. “I apologize for bringing pain and disappointment to the artists as well as the people on the issue,” Cho said. The independent counsel on the influence-peddling scandal is currently looking deeper into the blacklist. “We have come to the conclusion that the senior government officials’ creation and execution of the blacklist severely infringe upon the people’s freedom of thoughts and expression,” the investigation team’s spokesman Lee Kyu-chul said at a press regular press briefing. In a related move, the investigators said later in the day that they sought warrants to formally arrest a former culture minister, a former vice culture minister and ex-presidential aides for their alleged involvement in managing the blacklist. Two of them were charged with perjury as well. This marked the first time that the investigators have sought arrest warrants in connection with the blacklist case. Meanwhile, a high-ranking executive from Samsung Electronics Co., who was earlier expected to appear, was absent, citing health conditions. The university faces allegations that it gave admissions and academic favors to Choi’s daughter Chung Yoo-ra. The K-Sports Foundation and Mir were virtually controlled by Choi and collected large-sum donations from local conglomerates under the name of public projects. Investigators suspect Choi attempted to take control of the foundations’ assets. South Korea’s top conglomerate Samsung Group allegedly signed a 22 billion-won (US$18.3 million) contract with a Germany-based company owned by Choi and financially supported her daughter Chung’s purchase of horses, equestrian training and other costs. The K-Sports Foundation’s staff said Chung “lacked talent” as an athlete and claimed she spent more time on leisure instead of training. Chung was arrested in the northern Danish city of Aalborg last Monday on charges of illegal stay and has since been held at a detention center in the country. Previous hearings questioned business tycoons, presidential staffers and other figures linked to the scandal but mostly ended fruitlessly amid the absence of key figures and witnesses’ reluctance to deliver critical testimonies. Culture Minister Cho Yoon-sun speaks during a parliamentary hearing at Seoul-based National Assembly on Jan. 9, 2017.